The reliable 2019 Heartland Cyclone 3600 5th Wheel Toy Hauler is loaded with wonderful amenities and camping essentials! You'll save thousands on this superb Toy Hauler at Lakeshore RV Center because we offer wholesale prices! It's just one of the reasons why we're #1 in RV sales and service! You can visit our lot at 4500 E Apple Ave Muskegon Michigan 49442, or have us bring you your dream RV with our 24/7 nationwide delivery! Give us a call today at 231-788-2040 and we'll help you find the right RV for you at the nation's lowest price! The 2019 Cyclone 3600 is roomy inside at 39' 4" long and 8' 5" wide, with its 3 slides that maximize the living space! And you'll enjoy a perfect climate inside no matter what the weather thanks to the efficient 15000 BTU a/c unit and the modern 35000 BTU furnace! The King bed inside the master bedroom is among the comfiest sleeping accommodations throughout the entire campground! Of course, it's not the only cozy place to sleep inside this camper! Up to 7 people can sleep in peace and quiet! Enjoy the privacy of your own Porcelain Foot Flush toilet and shower inside the bathroom! With 60 lbs. of LP tank capacity, your morning showers won't go cold! There's both a 40 gallon gray water tank and a 80 gallon black water tank, so you won't need to look at or smell your dirty water and waste while on vacation! Love your outdoor toys? 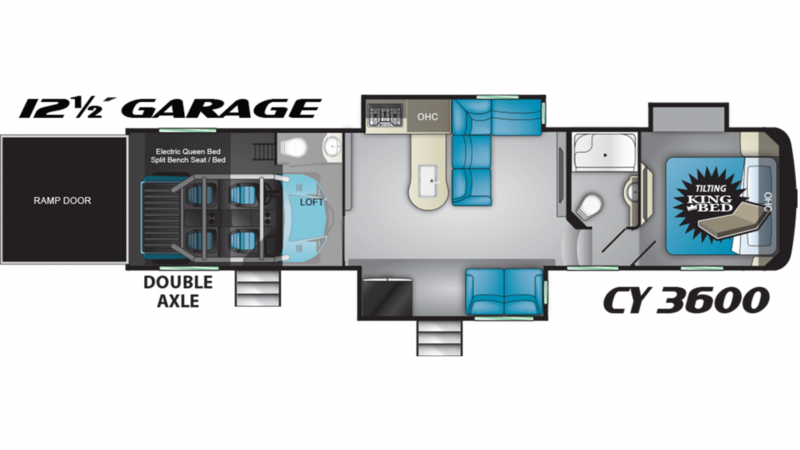 You can bring 'em along every time you hit the road in the Cyclone 3600, thanks to the roomy 12' 6" garage in this RV! And with its rugged lbs. of cargo capacity, it can handle the load with ease! The half bathroom, in addition to the master bathroom, makes this model a great choice for large families! It provides an extra sink and Porcelain Foot Flush toilet! Up in the loft, your guests will find additional sleeping space in the comfy loft mattress!